Christmas 1923 was Katharine Reynolds’s last at Reynolda House. The holiday was a private time for this family of public prominence, yet through menu cards and mementos archived at the estate, we glimpse a time of splendid celebration and one woman’s generous spirit. Christmas celebrations served as bookends for Katharine Reynolds’s time at Reynolda House, the family estate in Winston-Salem that she envisioned and built with her husband, R.J. The couple and their four children moved in just in time for Christmas 1917, and as movers carted chairs and rugs and bed frames into the house, deliverymen were arriving with the holiday gifts and provisions she had ordered. Katharine, a noted philanthropist, socialite, and progressive social reformer, created a home for grand entertaining, though the family called it simply “the bungalow.” As a North Carolina native and a mother of young children, Katharine wanted family and friends to feel welcome in her home and around her table. 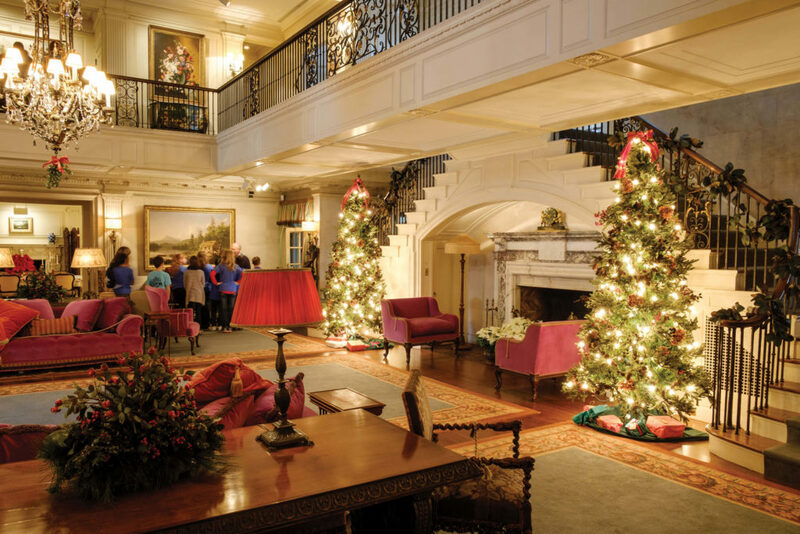 Christmas at Reynolda was a family gathering, not a public event. But it’s Katharine herself, not the historians, who tells us how the family feasted in 1923, thanks to handwritten menus kept in the estate’s archives. These menus — Christmas breakfast, Christmas dinner, and the refreshments served at a card party held two days later — paint a sensory portrait of the sights, smells, and tastes of a family, and an era, at their festive best. 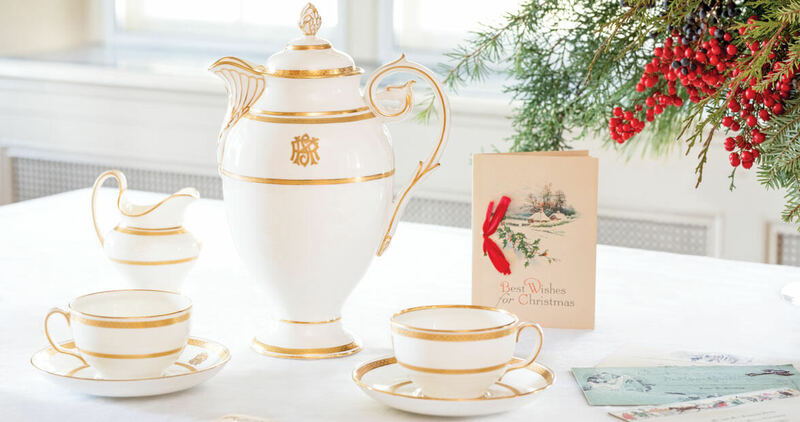 Meals at Reynolda House combined local fare from the estate — from string beans to turkeys — and special delicacies that Katharine ordered from other cities, all of it served on Tiffany china and silver. The estate-grown items reflected Katharine’s progressive ideas about farming and land stewardship, with the goal of making farming more sustainable for all rural families. Cooks prepared a variety of vegetables from the winter garden, including beets, lettuce, carrots, spinach, and turnips. Oranges and grapefruit arrived from Florida, while canned lobster, shrimp, green turtle, apricots, pearl onions, olives, and artichoke bottoms came primarily from Baltimore. The bounty was put to good use over the holiday, starting on Christmas morning. A 1923 menu card reveals that the family awoke to a breakfast of fruit, “birds on toast,” bacon, fried hominy, and waffles. “Birds on toast” is exactly what it sounds like: little songbirds or reed birds with their feathers removed, broiled in butter, and served on toast. Serving things atop toast was posh in the 1920s — the forerunner to our avocado toast, perhaps. Christmas dinner was lavish, and there was always a turkey. Two turkeys, actually. One was presented on a silver platter for the head of the table to ceremoniously carve the first slice. Meanwhile, in the kitchen, a second turkey was carved and quickly substituted for the first turkey at the table. The chestnut dressing would have included local chestnuts, still available before the devastating blight that wiped out the once-plentiful trees. Sweet potatoes with homemade marshmallows would have been new and fashionable in 1923, a charmer. Other rich and savory sides rounded out the flavors: spinach with eggs, onions in cream, beets, sour pickles, and salty nuts. Plum pudding with brandy and hard sauce not only ended the meal: It was a real showstopper. The traditional English Christmas treat is steeped in history — and liquor. Similar in texture to fruitcake and mincemeat, plum pudding is full of dried fruits (“plum” being a generic term for all dried fruits, such as raisins and currants), citrus peel, and aromatic spices bound with suet. Cooks often prepared this dome-shaped pudding weeks or months in advance, soaking it in brandy (for flavor and preservation), and setting it aside to age and mellow. One might debate the appeal of any dessert that tastes better the older it gets, but the presentation of the plum pudding would have made for stunning dinner theater. The card party refreshments menu echoes ingredients seen in the Christmas breakfast and dinner, perhaps as a way for staff to make the most of the special items in the larder. We see a variation on birds on toast, this time stuffed with some of the chestnuts and topped with gravy. Sweet potatoes here take the form of croquettes. And another culinary trend appears: tomato aspic. Molded gelatin salads caught America’s fancy in the early 20th century and remained popular for decades. Along with olives and nuts, guests nibbled celery, which wealthy families had first made fashionable during the Victorian era. Celery back then was a food so chic that it warranted its own serving vessels to display the stalks: a crystal dish to cradle them or a porcelain vase in which they stood upright in cool water like cut roses. Katharine died in New York City in the spring of 1924, but before her death, she wrapped gifts for her children so that they would have one last Christmas present from their mother. For years after, the Reynolda staff decorated and prepared for Christmas in case any of the children wanted to come home, never knowing if they would, but ensuring that they would feel at home if they did. To honor Katharine Reynolds’s Christmas spirit, Chef Adam Barnett of The Katharine Brasserie & Bar in Winston-Salem toured Reynolda House and spent time with her menus to plan a special holiday meal, served December 7 to 15. The three courses with wine pairings — rutabaga and sweet potato bisque (above), roasted breast of pheasant, and roasted walnut and coffee pound cake — are a merry mix of elegance and comfort. 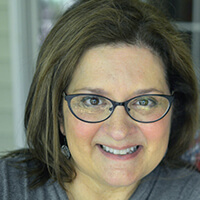 “When you’re cooking,” Barnett says, “you have the opportunity to create memories for life.” In other words, he knows what Katharine, ever the hostess, knew: The meaning is not simply in the meal, but in the experience. For more information, call (336) 761-0203 or visit katharinebrasserie.com.